A lot of times when you hear the word “patchwork”, an image of quilts will pop into your head. As much as I love them, I don’t have the time or patience to make many of them…. but I do have time for Mini Patchwork Projects! 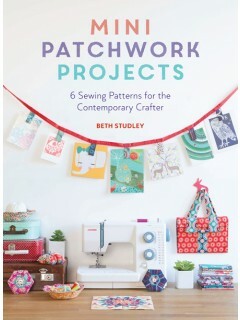 This is a new book by British fabric and pattern designer, Beth Studley, tackles 6 adorable patterns that can be easily created in a day. Included in this book are the instructions to make a fun picture garland, reversible trinket bowls, a great petalled pin cushion, a hexi needlecase, curvy coaster set, and a notebook cover (all are featured on the cover photo). Even if you’re not familiar with the techniques listed, they are described in the back of the book along with all of the templates necessary to complete the projects. This book is a good introduction to a variety of ‘quilting’ styles, but on a smaller, more manageable scale. The projects themselves are cute, functional, and an easy way to use up those fabric scraps! I’m hoping to eventually tackle the pincushion…. because we all know I sort of have a pincushion obsession! This entry was posted in Uncategorized on September 12, 2016 by stacy.